As curious beings, we often question where we came from and how we came to be. We used to think of our evolutionary tree as a straight branch, with an animal that looked like a chimp furthest back, a half chimp half man transitional species, and then us. However, as the field of paleoanthropology progresses, new finds muddy the waters of this thinking. 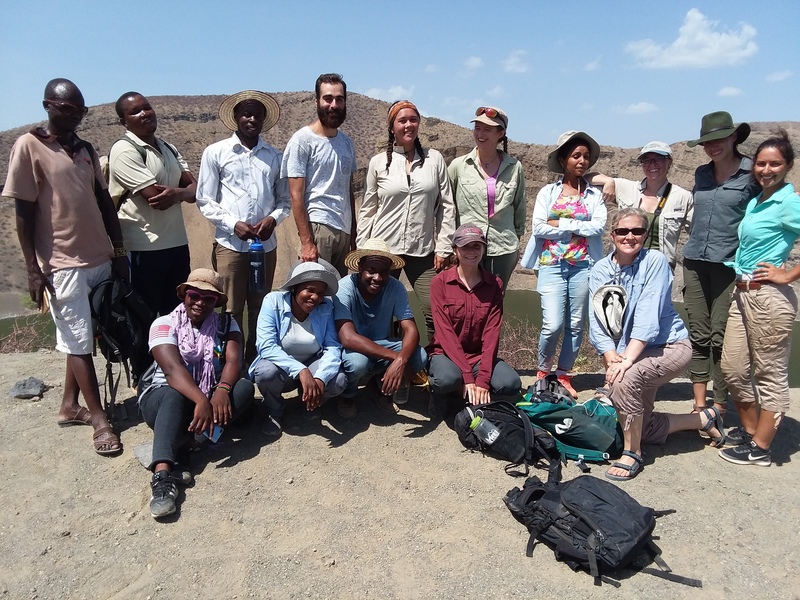 Groups of hominins, such as the australopithecines and paranthropines (robust australopithecines) that have been proposed to be directly in our lineage show higher amounts of species and body plan diversity than we ever imagined. In addition, species of both of these hominin genera have overlapping dates with members of our genus, inferring that many archaic hominins may have shared the landscape at the same time! Rather than a simple branch, the hominin tree has become bushy and controversial. 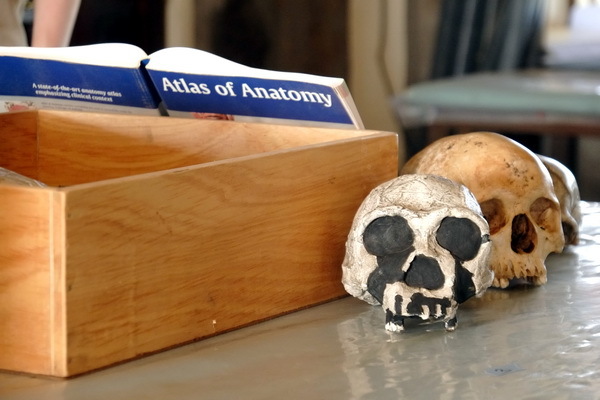 Our controversial hominin fossil record. Courtesy of Matthew Borths. However, while our direct evolutionary branch is quite controversial, one thing we can track through the evolution of our lineage are general trends in morphological changes. 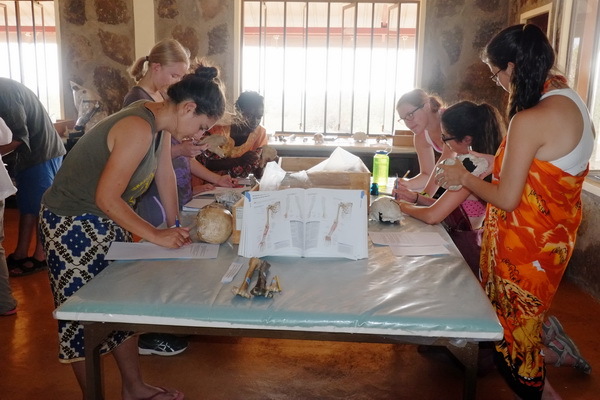 For final human evolution projects, The Origins Field School students chose a specific part of the body and mapped how it had changed in our lineage throughout time. In addition, students assigned various character states to the region of the body they focused on for different hominins. After all the character states were compiled, we were able to build our own phylogeny of the hominin lineage! (See Deming Yang’s last blog post about phylogenetics here). 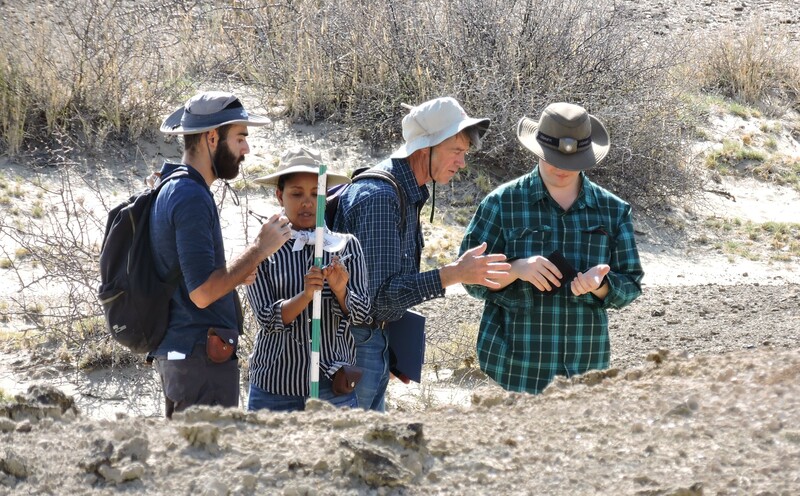 To excel at these projects, students spent time in the lab comparing casts of ancient hominin remains to Homo sapiens to witness the changes in morphology first hand. 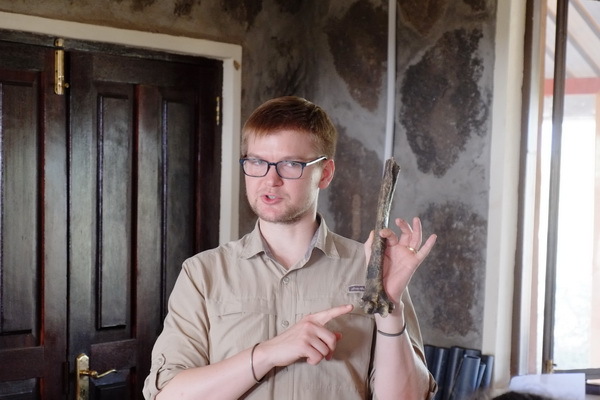 Professor Borths shows the students the distal end of a humerus. Photo credit Deming Yang. One example of a morphological trend in hominins can be seen through dental changes. Since we do not know what our last common ancestor with a chimpanzee looked like, we often assume that this ancestor was quite chimp like, and could have even had a chimp-like dental plan. Compared to modern humans, chimpanzees have much larger incisors and canines. 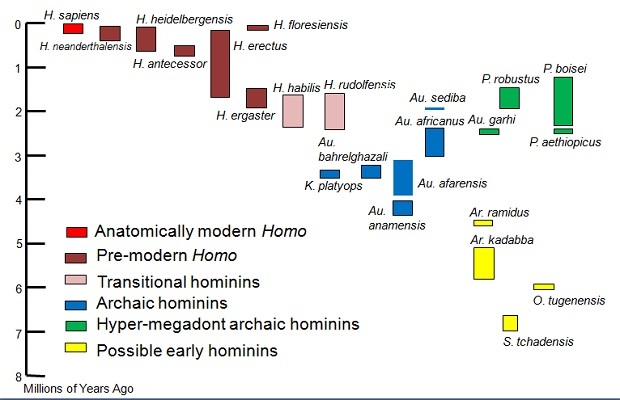 However, this trend has been seen all throughout the evolution of our lineage, with australopithecines (ancient hominins shown in blue in the chart above) having smaller canines and incisors than chimpanzees, and members of the genus Homo having smaller canines and incisors than australopithecines. From left to right, dentition of a chimpanzee, an Australopithecus afarensis, and a modern human. 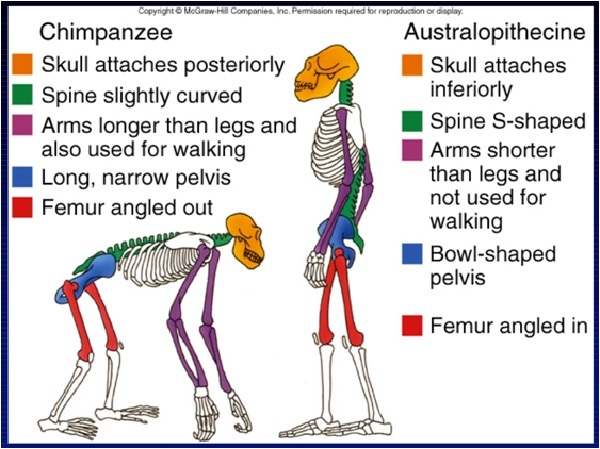 Another major trend in the hominin lineage was morphological changes that lead to being a more efficient biped. While there is evidence hominins had the ability to walk on two legs over 5 million years ago, it was not until our genus, Homo, that we see fossil evidence of hominins that would have had a gait similar to ours today. Fortunately, there are a suite of morphological traits that coincide with bipedalism that we can observe in the fossil record. 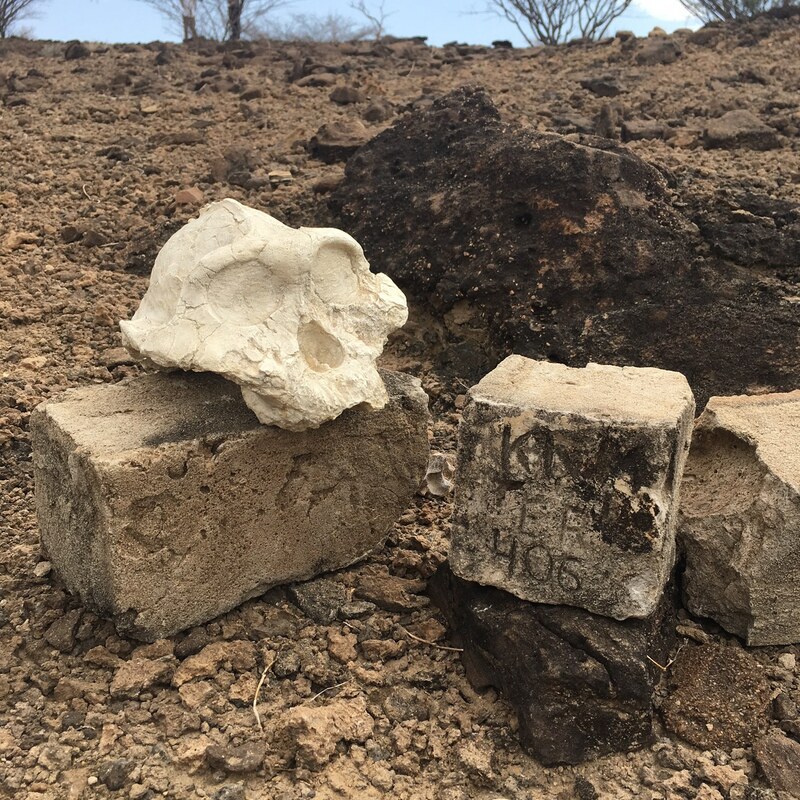 For example, as paleoanthropologists, we can infer that the australopithecines walked on two feet by the position of their foramen magnum (the hole in the skull in which the top of the spinal column passes), and also the shape and position of the bones in their pelvis, spine, feet and hindlimb. Major differences in chimpanzee morphology and australopithecine morphology. Courtesy of Matthew Borths. While australopithecines were bipedal, they probably walked differently from how we do today. 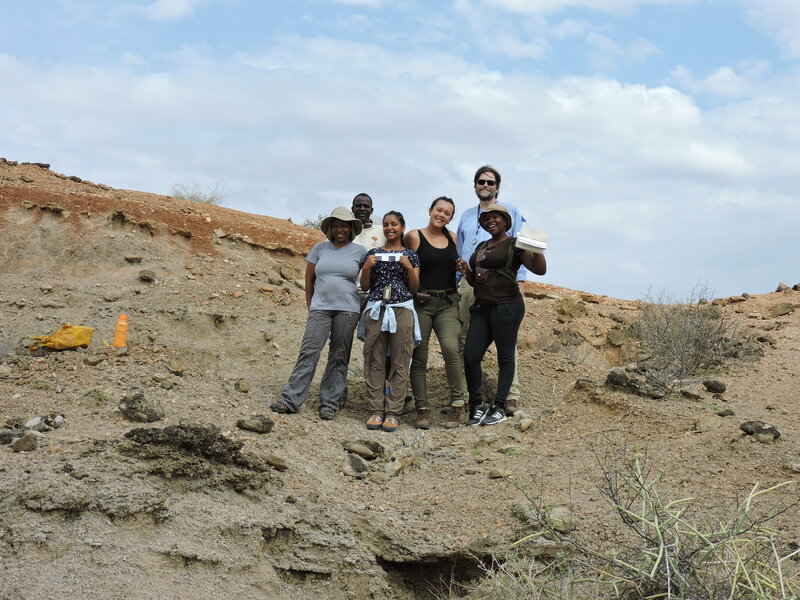 Their femurs (thigh bone) were shorter and their pelvis flared out much wider than members of our genus. This would have caused a walking gait quite different from our own and likely made it difficult for australopithecines to run efficiently. Also, they still maintained some primitive arboreal characteristics, suggesting that australopithecines may have spent part of their time in the trees as well. For example, they still had long, curved fingers that could have been used to efficiently climb and grasp onto trees. 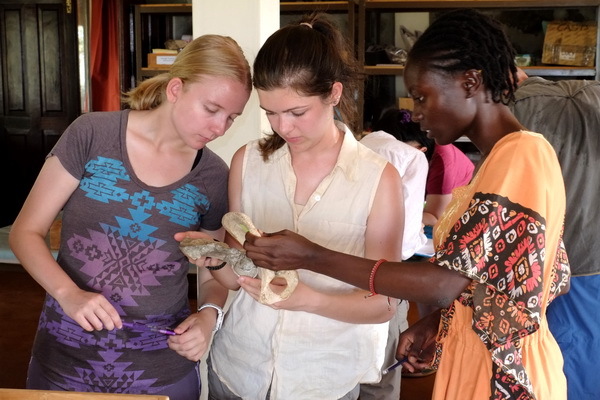 Amanda, Nicole and Ester compare a modern Human pelvis to Lucy’s (Australopithecus afarensis) pelvis. Photo credit Deming Yang. Students hard at work comparing the morphology of different hominins! Photo credit Deming Yang. Other major morphological changes in our lineage occur in the cranium. As we get closer to modern humans, we see a large increase in cranial capacity compared to body size, along with a more reduced facial prognathism (protrusion of the lower face). By looking at all of these characteristics, and creating character states for each different feature, we are able to hypothesize which hominins are more closely related to each other by constructing a phylogenetic tree. 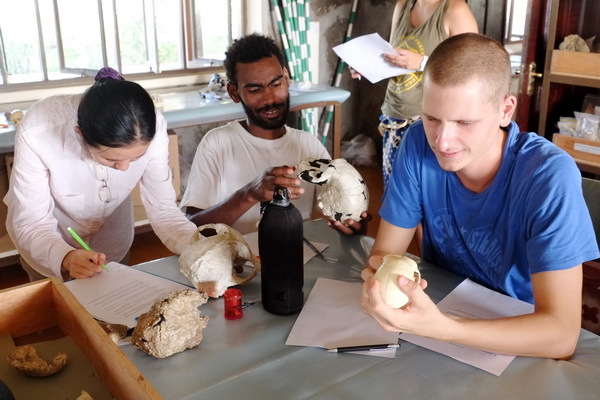 Yishan, Goitom and Charlie comparing hominin cranium. Photo credit Deming Yang. 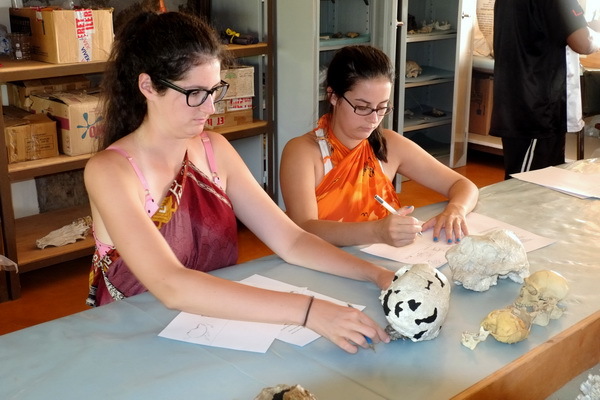 Izzy and Maria draw the casts of different hominins. Photo credit Deming Yang. 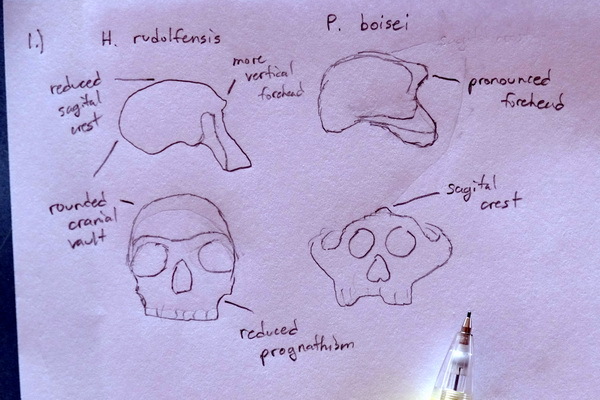 Student drawing of the skulls of an early member of our genus (Homo rudolfensis) and a paranthropine (Paranthropus boisei). These two hominins may have been alive at the same time! Photo credit Deming Yang. 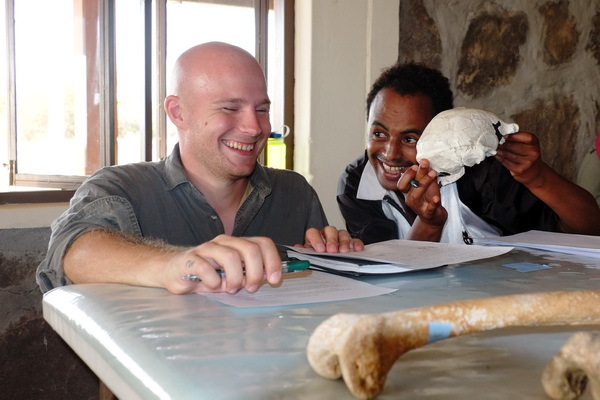 Yared compares a hominin cranium to Felix’s bald head. Photo credit Deming Yang. While we are unsure what species are directly part of our lineage, through the morphology of different hominin specimen we can hypothesize ancient hominin life strategies and behaviors and make parsimonious inferences on how our complex evolutionary tree is best designed. As more paleoanthropological work is done and more archaic hominin fossils are found, we may be able to get a better sense of where we came from. 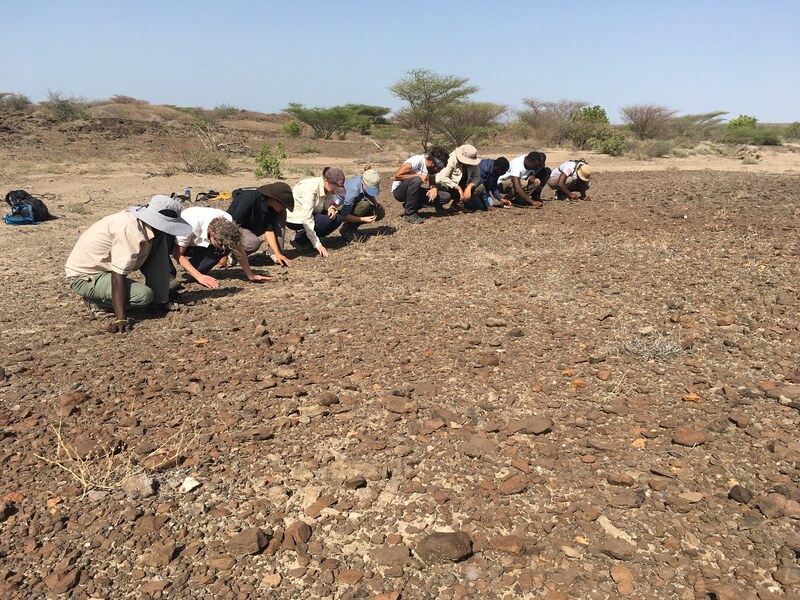 To complete the trek through our origins, the students are switching over to Turkwel for their last module, Archaeology. Stay tuned as the students learn about the material culture and tools utilized by our ancient ancestors.